Yr Hen Stablau is an energy-efficient holiday cottage near Machynlleth and the Centre for Alternative Technology, Mid Wales. The cottage is spacious and secluded in a wooded garden, but only a mile from Machynlleth, the ancient capital of Wales. The stables building was converted with maximum re-use of original stone and timber, has LPG gas and solar heating, double glazing of all windows, thick insulation and draught sealing, low solvent organic paint on all walls, underfloor heating, 92% efficient boiler and a woodburning stove using on site logs. 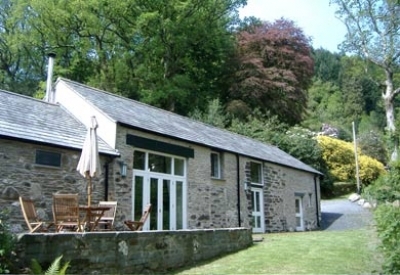 The cottage won the Snowdonia Sustainable Self Catering Award 2008 and has a Green Tourism Business Gold award 2010. Yr Hen Stablau is in the Dyfi Biosphere, a Unesco recognised area of diversity and sustainability, and contributes by conserving energy, and supporting local businesses and culture. Nearby in the Biosphere is the Ynys-Hir RSPB bird reserve, for birdwatching and estuary walks, and the Dyfi Osprey Project which is satellite tracking three young ospreys born in the Valley in 2011. The cottage overlooks the River Dyfi and is within easy reach of the coast at Aberdyfi with its long sandy beach and championship golf course, the mountains of Cader Idris and Snowdonia, arts centres in Machynlleth and Aberystwyth, and the local network of footpaths, cycle trails and Mach mountain biking routes. The cottage provides very high quality, attractive accommodation for up to six. The ground floor has sitting room with french windows on to a slate terrace and woodland view, kitchen/dining room with original beams and farmland view, pantry, a double or twin bedroom, shower room/WC and hall. The first floor has two twin bedrooms with original beams, landing and WC. A cot is available on request. The ground floor is fully wheelchair accessible. The cottage is available for weekly lets 10 months of the year (not Nov and Jan) and 3 or 4 day breaks in mid and low seasons. The price includes all electricity, gas, one load logs for the woodstove, spring water supply UV filtered and organic cotton bedlinen. Pets are welcome, there's ample parking and only a mile to shops, cafes, pubs and restaurants.